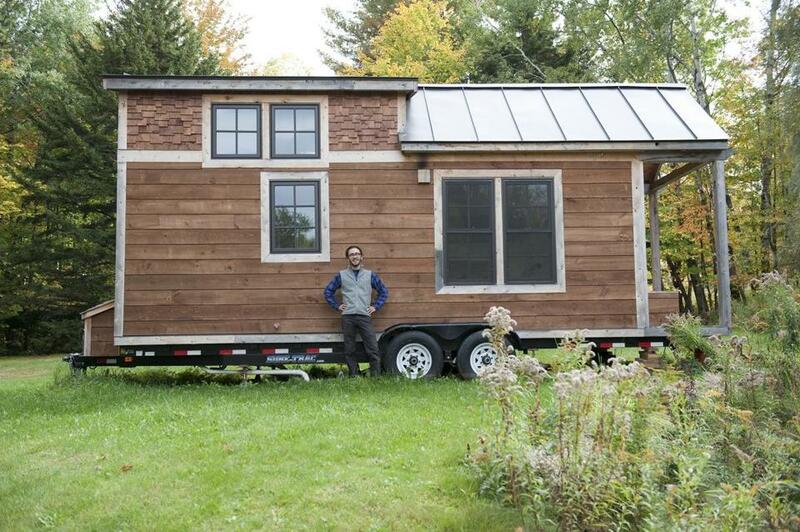 Inspired by tiny house blogs, Ethan Waldman of Morristown, Vermont, built himself a movable home. Inspired by tiny house blogs, Ethan Waldman of Morristown, Vermont, built himself a movable home using quality materials such as local cedar for the exterior siding. The untreated trim will age to a silvery gray. Editor’s note: This article is from the November/December 2014 issue of Design New England. Read the full edition. For regular updates from editors and contributors visit Design New England’s blog. Seeing the project as part of an up-and-coming trend that aligned with his firm’s values, architectural designer Milford Cushman of Cushman Design Group in Stowe, Vermont, offered to sponsor Waldman’s effort by contributing pro bono to the design. He says he wanted to support Waldman’s taking responsibility for his “footprint.” Also, having lived on a boat for a year and in tents in the Ontario wilderness, Cushman relished the opportunity “to do a really, really tight design, where every move matters,” he says. Bednarz, who himself came to the project with experience working on boats, says he sensed that making the most of small spaces is a design challenge Cushman especially enjoys. The tiny structure built onto a steel trailer features a “great” room with a built-in couch with storage underneath; a wallmounted folding table that doubles as a desk; a kitchen with sink, three-burner range, oven, refrigerator, and custom cabinets; a bathroom with a shower and basic, composting toilet; a sleeping loft with ladder; and a tiny front porch. A compact tank nestled under the sink holds 40 gallons of water. An on-demand unit designed for RVs supplies hot water, and a Dickinson propane heater — used in about half of all tiny houses constructed — and spray-foam insulation in the walls, roof, and floor keep the house warm. Waldman was able to tap into an existing outbuilding on the property for electricity. High-quality materials such as shiplap pine siding, cedar shingles, and Marvin windows give real-house character to the exterior. Inside, cherry floors lend richness to the living area. Walls are paneled with local pine, partly because traditional drywall might have cracked whenever the house was moved. Waldman also chose pine for the floor of the loft and for the interior trim, which he had planed to a half-inch thickness to save on weight as well as space. He then pickled it for a soft, warm finish. Overlapping copper shingles line the shower stall, adding pizazz to the bathroom. The movability of the structure presented some serendipitous construction opportunities. When it was time to have the house insulated, Waldman towed it to the contractor’s shop, reducing the cost of the job by about 10 percent. He used the same strategy to get the roofing done. At 7 feet 4 inches wide by 20½ feet long (not including the 3½-feet-deep front porch) by 13½ feet high, the house is within the limits of what can be towed behind a truck in Vermont. Once, when it was being towed through the town of Stowe, the roof clipped a few sagging utility cables. Fortunately, the police officer who pulled Waldman over found the tiny house intriguing. “I could do with one of these,” he said after looking inside. Waldman, who has since published a guide for tiny house aficionados, identifies three types of people who build them: twentysomethings, especially those with college debt, not sure they want or are able to commit to a mortgage; people who have lost their homes to foreclosure; and retirees who want to stretch the money they have and live with roomier budgets. 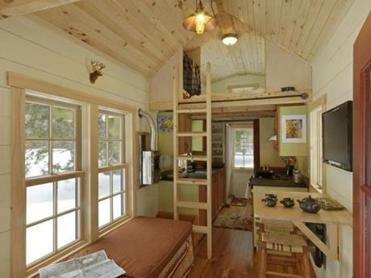 Even some families have found tiny houses workable. For all of them, the mind-set seems to be live simply with less. Waldman doesn’t rule out the possibility of having another primary residence in, say, five years, and using the tiny house for work, travel, or rental income, but he and Carpenter are enjoying it so much that, for now, they see no reason to live elsewhere. Ethan Waldman’s e-book, Tiny House Decisions: Everything I Wish I Knew When I Built My Tiny House, is available at thetinyhouse.net.